I have been testing this product on samples of Cypress to see how it would perform. Samples were set out with 3 coats of the product, facing due south and located near the ground such that it would be located on the kick plate of a French door. Sample was placed May 2007 through today. This product is terrible. I am really surprised Wright owners are saying this is the best product out there. I also tested darker colors of the same product with better results. But, Natural Light is really the color Wright visioned for his Usonians. I don�t think technology exists yet. You can see the previous owner used an Olympic stain product with a redish tint. Both product and color are terrible. 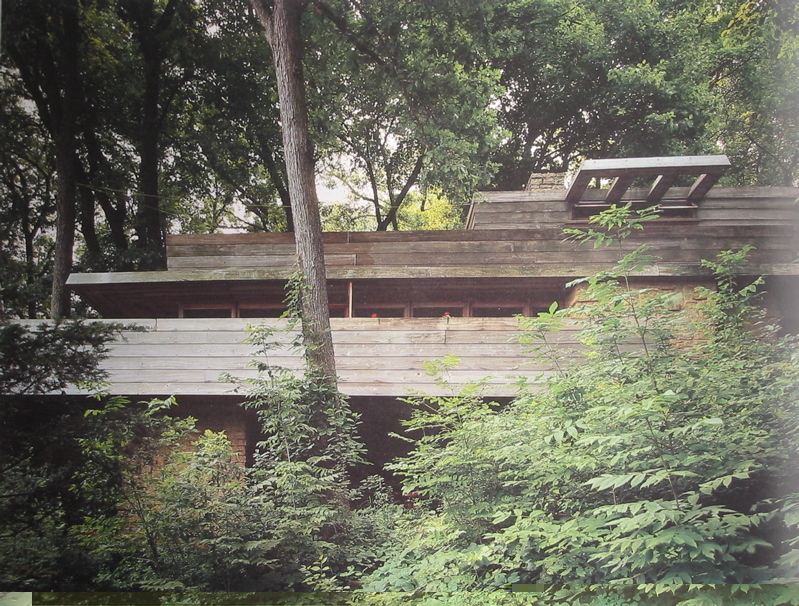 The problem with Wright's vision for his Usonian Homes and Cypress was that he was an advocate of little or no sealer, resulting in a weathered grey look. Unfortunately, the cypress deteriorates and eventually has to be replaced. Sikkens is not the ideal product, but its the best we've seen so far. It not only seals the wood, but is a pretty effective UV blocker. The trouble with the product is that it has a distinct orange color, and its very difficult to mix their "standard" colors to get an acceptable tone to the wood. Don't give up, I still think its the way to go. Does anyone know of any other products? 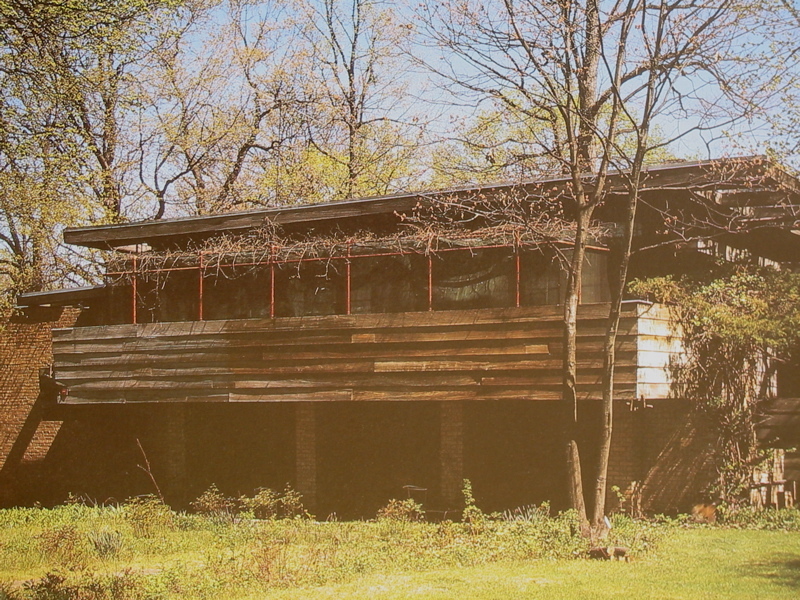 In Wright's recipe list for the Usonian house ("The Natural House," 1954, p 83), no.7 reads "No painting at all. Wood best preserves itself. A coating of clear resinous oil would be enough. Only the floor mat of concrete squares needs waxing." 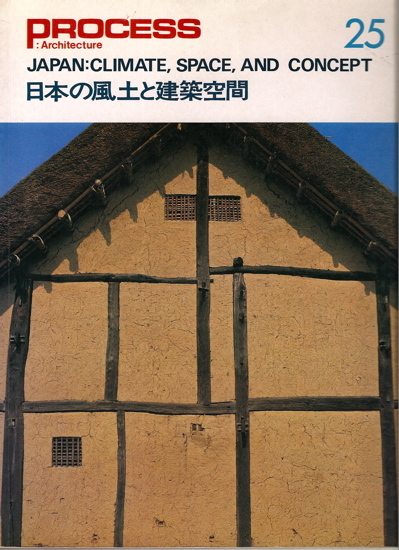 Whereas I agree with the treatment of the concrete floors, I'm sorry to say that FLW was WRONG about wood - in some climates, like Japan, wood lasts well unprotected, but in most US environs it must be sealed and protected in some way. Without disagreeing, I must ask in what ways does Japan's climate differ from that of, say, Wisconsin ? I will do some reading. Wisconsin climate varies from tropical (100 deg. F w/ 100% humidity) to near Arctic (-30 deg. F, 0% humidity) - there are something like 90 freeze-thaw cycles each year. Wood gets wet, expands/contracts with frost. Rot from moisture, deterioration due to loss of natural oils when moisture dries from the wood. Carpenter ants, termites, etc. love wet, unsealed wood too. Wright liked cypress because of its weathering characteristics, but in time it deteriorates as well. Its nature doing its thing. Here are some additional Sikkens photos from my research. These performed much better than the Natral Light left exposed for 1 year. Two samples on left were exposed from 12/15/2005 � 4/25/08 and facing due south. I put stakes on them and pushed them into the ground so to be directly exposed to spashing water/rain and snow. I noticed the kick plates on a french door are usually first to go. Natural, Natural Oak (same as Baird pic), and Teak (The Teak sample was not exposed to the elements). As I have discovered from this research, Sikkens darker colors perform best over the Natural Light color that Wright would most likely have chosen. The Teak color is what we will probably use on Haynes. I would prefer Natural Light but it will be impossible to remove all the current dark stain. Furthermore, I want something dark so it will performance well over time. I also had a representative from Sikkens come out to Haynes for a formal evaluation. He confirmed what I just mentioned above. I also visited Mr. Reisley of the Reisley House. He had his entire house done with Sikkens Natural. He also confirmed the dislike of the �orange� color and mentioned how Wright would not have chosen it. I have also been to Zimmerman and contacted the curator. She mentioned they used Sikknes Natural as well. All organe. I guess it is not a science but an art. You might also try the Rosenbaum House Foundation in Florence, Alabama. I believe they also went through an extensive color sampling process. 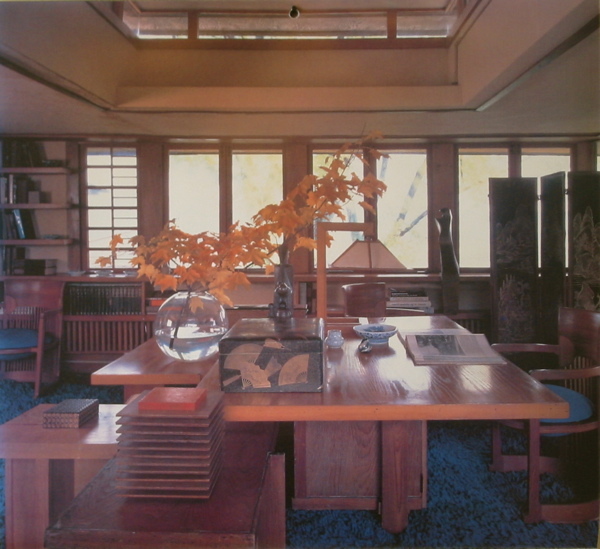 From "Frank Lloyd Wright's Rosenbaum House, The Birth and rebirth of an American Treasure" by Barbara Kimberlin Broach, Donald E. Lambert, AIA, and Milton Bagby. Pomegranate publish. There is quite a bit before this paragraph talking about sanding the wood for ever.. then it says..
"Don Lambert began researching products with which to refinish the newly sanded wood. "The Sikkens Company has a research facility in Pontiac, Michigan. We sent them samples of the old and new cypress, as well as the fir plywood we used for the ceiling. We tried to find some samples of the old wood taken from protected areas, out of the weather and direct sunlight. Sikkens formulated two different batches of stain because the new wood absorbed differently than the old wood. The exterior finish also had UV protectant added." Work was completed in 2002. I have some photos on my site taken on Oct 26,2007. The wood looks great, IMO.. I certainly sympathize with those who are trying to care for old wooden houses. The photos above of Baird and Rosenbaum are heartwarming examples of this care. shows similar finishes. Yet the exteriors of that same complex (Taliesin North) had rough and dry exterior woodwork during Wright's final decade, at least. I believe he liked it that way. The problem with (artistically, poetically) weathered surfaces is that they are not able to be maintained in that state indefinitely, while more highly-finished (and protected) surfaces can, with periodic renewal of finish, (potentially) be kept intact indefinitely. As for color, Mr Wright, and many many fine woodworkers through the centuries, would all agree that the best thing to do to wood is to let its own color show through a clear finish. The principle reason to stain is to bring disparate colored boards (each of which, within one specie and one forest, will have different tones and values of the same basic color) into better harmony with each other. This need is amplified when the effects of water-staining and other deterioration are found on old exterior surfaces. So, although one could disparage the addition of toners to the clear finishes shown above, the alternative would be to display, and even exaggerate, the irregularities of color and value in the (invaluable) original boarded surfaces of these houses. I think Frank was rather consistent in what he said and wrote about wood finishes of his houses, yet at the same time conveniently pragmatic depending on what the issue was. On the exterior, he was only interested in the natural characteristics of the wood as far as it helped define the architecture. I feel he never intended the current Rosenbaum "look", which is a more common and perhaps more visually appealing treatment (i.e. a neatly painted clapboard). His usual preference of no/little treatment indicates he had no problem with weathering (it wasn't his problem anyway!) and was not at all concerned about longevity either-it was always the architectural context and the nature of the material he wanted to express. On the interior, the need for daily utilitarian tasks such as dining and writing (as well as dust and preventing slivers) obviously required finishes to make a house usable. This may be stating the obvious, but it is a good example of how in every way Wright bent "reality" to accommodate his art as he saw fit, and he simply did not want an artificial look to his architecture-on the exterior at least. He would chuckle, if not protest, the concern and great effort many go through to preserve for the sake of preservation alone (especially the most finicky). Ironically, it does trump the architectural component he desired with the weathering, and opens the door for just about any rationalization in other aspects for preserving a Wright building. I actually have to agree the weathering adds more character, but then it is not my investment! I actually have to agree the weathering adds more character, but then it is not my investment! So if the wood is not sealed or protected, and it is left to weather, Over time does it finally break down and fall apart? Or does it just give it that really worn, grey look?.. It is interesting to think what Rosenbaum or Jacobs would look like with the wood worn and faded. The video that was linked by TNguy (another post) showned the Rosenbaum pre restoration. And it did have a more worn look. I am just wondering if that is what Wright wanted, would the home be able to stand up to it over time if not protected? Jim asks the pertinent question. It seems hard to argue that, in the above view of the Lloyd Lewis terrace, the parapet boards that are so obviously warped and (on the far left) split, would have gotten to that state if they had been protected by a finish since new. Incidentally there appears to be a change of color at a point about 2/5 of the way from the left end, in the photo above. It looks like there may have been a stain or finish experiment done here. . .? In your first photo I see one piece of Cypress on the left, which appears to be sanded properly with applied Sikkens. ( I assume with all three coats) The scrap on the right with traces of stain and or damage from UV and or dirt. If this is the before shot at the time you started your test, where is the aftermath a year latter? Also the bottom horizontal member of a door or casement window is a rail not a kick plate. Your samples clearly illustrate that you did not apply finish to the end grain on some of the samples an important surface that requires finish as well. If you look at the examples of the Braid and Rosenbaum you will note that there are no end grain surfaces exposed to the elements for they are protected by their respective stiles. Wood absorbs moisture on all six surfaces, it appears you did not apply Sikkens to important moisture absorbing surfaces. For best results on doors and casements the endgrain of the stiles must be coated as well. And for the finish to last 3,4 or 5 years all previous coatings must be removed correctly. Removed to fresh ,clean wood. in using this product, and you can see for yourself. There is no better open coating exterior finish for wood on the market!